If you are on a budget yet are hungry for a steak, this is the place to go. 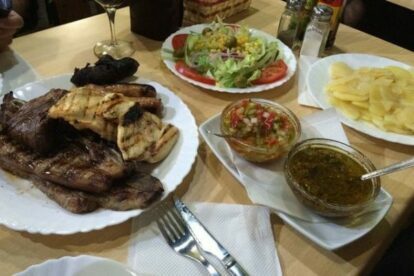 It is a family run Uruguayan steak house, only 10 min walk from Barceloneta station. It’s the kind of restaurant you would easily pass by and not even notice, that’s why it’s a place known mostly through word of mouth. The menu consists of salads, burgers or steak. Definitely try the steak. You have a selection of different types of beef. Personally I went for the entrecot. To go with the steak you either chose between salad, rice or potatoes, the latter being either French fries, creamy potatoes or baked potatoes. You won’t regret trying the creamy or baked ones. Make sure you save some space in your stomach because La Malandrina is not the kind of place you’ll leave hungry!